Salvini campaigning in Sicily in November 2017. NurPhoto/Press Association. 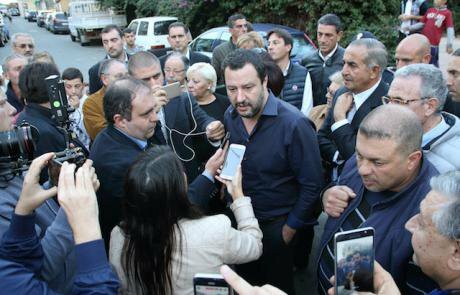 All rights reserved.After almost three months of jumping up and down in place, the newly invested Italian interior minister, Matteo Salvini, has hit the ground running in the worst possible direction. The head of the anti-immigrant party, the League, Salvini has positioned himself as the strongman in the unlikely coalition government recently formed with the ideologically fungible Five Star Movement. But there are no excuses for Salvini’s dangerous rhetoric, which is likely to inflame social tensions and intolerance while promoting policies that are both unrealistic and unsavoury. Limiting the ability of nongovernmental groups to rescue people in distress at sea and take them to a place of safety could contribute to more deaths at sea, strip Italy of the moral standing it has acquired over the last several years for its leadership in rescue at sea, undermine the valiant work of volunteers from nongovernmental groups and Italian Coast Guard and Navy personnel who have saved tens of thousands of lives at sea, and strip Italy of the moral standing it has acquired over the last several years for its leadership in rescue at sea.